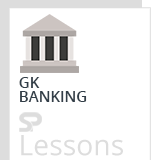 Banking Awareness Quiz 3 – Practice Sets article provides the list of several bank related questions to prepare aspirants of different competitive exams in India, primarily for banking related employment. The article Banking Awareness Quiz 3 – Practice Sets is very useful for different exams such as IBPS PO, Clerk, SSC CGL, SBI PO, NIACL Assistant, NICL AO, IBPS RRB, Railways, Civil Services etc. Q1. GSTN stands for which of the following? Q2. Which of the payment Services is available 24*7? Q3. QSAM stands for which of the following? Q4. How much GST is charged on the Purchase of fresh vegetables? Q5. Which section of Negotiable Instruments Act, 1881 deals with the Cheque ? Q6. Who governs the purchases of securities ? Q7. Which section of Negotiable Instruments Act 1881 deals with the Bill of Exchange? Q8. IFSC stands for which of the following? Q9. How much GST will be applicable for the purchase of Gold? Q10. GSTN creates a platform for which of the following? Q1. Indian Bank was established in which year? Q2. Punjab National Bank was first established in which city? Q3. Who is the Economic Relations Secretary in the Ministry of External Affairs of India? Q4. SEBI has imposed a fine of Rs. 27 lakh to which company for violating norms related to public holding and disclosures? Q6. What is the current GST rate on fertilizer declared by the GST Council? Q7. In which year RBI was nationalized? Q8. In which year the ‘National Housing Bank’ was set up? Q9. How many associate Banks do SBI has? Q10. DICGC stands for which of the following? Q1. Bharatiya Reserve Bank Note Mudran Private Limited was set up in which year? Q2. ‘You can bank always on us’ is the tagline of which bank? Q3. BRBNMPL stands for which of the following? Q4. Head office of State bank of Mysore is located in which city? Q5. Which is the oldest joint stock bank of India functioning till today? Q6. ‘A Friend You Can Bank Upon’ is the tagline of which bank? Q7. UTI stands for which of the following? Q8. In which year SIDBI was established? Q9. IFCI stands for which of the following? Q10. UTI was established in which year? Q1. In which kind of banking, the bank invests money mostly in government bonds and securities? Q2. What is the main motto of Green Banking? Q3. EXIM Bank was established in which year? Q4. Which bank has launched the ‘Image Debit Card’? Q5. GIC was established in which year? Q6. Which of the following banks has recently become Payments Bank? Q7. What is the minimum number of banks that should be involved in Chain Banking? Q8. Which bank recently has decided to block all Maestro Debit Cards for security based reasons? Q9. RTGS stands for which of the following? Q10. PNB was established in which year? Q2. Who is appointed as the New CEO of Syndicate Bank? Q3. In which year Syndicate Bank was established? Q4. ‘Good people to grow with’ is a tagline of which of the following banks? Q5. In which city the head office of Indian Overseas Bank is situated? Q6. Which of the following is the Core Banking Solution of Reserve Bank of India? Q7. Which of the following is the Apex Organization for Industrial Finance in India? Q8. What is known as a Banker’s Cheque? Q9. Auction of Govt. securities is done through which of the following system? Q10. What is the main purpose to form the RRBs? Q1. Which of the following companies is the technology partner of RBI for launching e-Kuber? Q2. Which of the following can be called as an inter-bank application? Q3. At which place the Bankers meet and settle their Mutual accounts and claims? Q4. GST settlements are proposed to be done through which of the following applications? Q5. Who is the CEO of HSBC Bank? Q6. What is the concessional rate of GST imposed by the Govt, on the helpful devices for the physically challenged people? Q7. What is the raised limit of Foreign Portfolio Investors(FPI) investment in Govt. Securities by the RBI? Q8. AIIB stands for which of the following? Q9. In which country the Head Quarters of Asian Development Bank is situated? Q10. On which day of 2017, the Save Public Sector Banks Day (SPSBD) is celebrated in India? Q1. UFBU stands for which of the following? Q2. Which of the following funds are dealt by the Capital Market of Indian Financial System? Q3. MBS stands for which of the following? Q4. Who is the Principle Regulator of Indian Capital Market? Q5. ARM stands for which of the following? Q6. ‘Where service is a way of life’ is the tagline of which bank? Q7. ‘Where service is a way of life’ is the tagline of which bank? Q8. Who is the CEO of UCO Bank? Q9. What is used by the monetary authorities to control the inflation? Q10. The head Quarter of Punjab National Bank is situated in which city? Q1. Indus OS has partnered with which bank to launch OS-integrated Unified Payment Interface payment platform in India? Q2. Which of the following banks does not sign agreement with EPFO regarding Provident fund related issues? Q3. Which bank has signed MoU with Santander to promote India-UK trade? Q4. EPFO stands for which of the following? Q6. As per the instruction of RBI, in case of any unauthorized online banking transaction, within how many days customers must report? Q7. Who is appointed as the Non-executive Chairman of Union Bank of India? Q8. Which Indian Finance Company has signed MoU with the Govt owned Vnesheconom Bank of Russia? D. HSBC Invest Direct (India) Ltd.
Q9. Swiss Bank will share information automatically of financial account information with which of the following countries from 2019? Q10. Which of the following pairs of PSU banks was merged? Q1. SLR stands for which of the following? Q2. What is the maximum limit of SLR? Q4. ‘Much more to do with You in focus’ is the tagline of which bank? Q5. In which year Bank of Maharashtra was established? Q6. According to RBI, what should be assets size of the NBFCs to offer New Pension Scheme? Q8. Canara HSBC Oriental Bank of Commerce Life Insurance has entered into an alliance with which bank for marketing various life insurance products? Q9. Which of the following banks has launched a digital village initiative in Nepal? Q10. What will be the recent growth rate over the coming decade according to the Harvard University research? agreement to explore the merger possibility? Q2. FCNR stands for which of the following? Q3. What is the function of Mixed Banking? Q4. ‘Experience Next Generation Banking’ is the tagline of which of the following banks? Q5. In which city the head office of South Indian Bank is situated? Q6. In which year Andhra Bank was founded? Q7. Which of the following unit of money has the equal intrinsic and face value? Q8. Which money has less production cost than its face value? Q9. NHB stands for which of the following? Q10. NHB is a subsidiary of which of the following banks?